It was a below-par performance from the Toffees who handed the visitors a simple three points at ​Goodison Park on Saturday. Wolves' opening two goals came from a needless penalty and free kick concession by the Toffees. The Midlands side were as good as their opponents were poor and were deserved winners on the day. Just one place separated Wolves and Everton going into this one, as they both look to secure that coveted top seventh place, and it didn't take long for the breakthrough to come. Leighton Baines wasn't expected to start after suffering with injuries recently and he looked off the pace from the get-go. Matt Doherty ghosted past him into the area and the stalwart responded by upturning the Wolves man for a penalty just five minutes in. Ruben Neves made no mistake with his effort from the spot, giving his side an early lead. Everton's defence didn't wake up from their early warning and only had Jordan Pickford to thank for keeping them in the game with a magnificent save to deny Leander Dendonker in the 19th minute. Wolves continued to turn the screw but couldn't add to their lead and they were hit with a sucker punch when Andre Gomes levelled with a brilliant solo effort. Wolves had the final say of the half though, recapturing the lead as Raul Jimenez got on the end of a good set-piece, powering the ball past a stranded Pickford to make it 2-1. Dendonker finally put the game beyond doubt for Wolves in the 66th when he was the first to react in the area following Pickford's deflected save. Ironic chants of 'sign him up' came from the Everton home support as an invading cat stalled play shortly afterwards, showing the fans were still in good spirits at least. The Evertonians had little else to cheer about in all honesty, their side was defensively porous, full of clumsy challenges and devoid of creativity, falling to a humbling defeat. Everton just weren't at the races today and the fans will be bitterly disappointed at home to one of their immediate rivals. Defence was a particular weak point, they were far too easily carved open by Wolves from all angles. Starting Baines proved to be a big mistake with the player costing his side a goal before being forcibly withdrawn inside 35 minutes. Things improved slightly after Baines came off but Everton remained second best and had little to cheer about barring the one moment of brilliance for the equaliser. STAR MAN - Barcelona loanee Andre Gomes has struggled to make an impact for Everton this season with just one assist in 16 appearances before this game. The Toffees got a glimpse of what he's capable of here though and just when their side was in desperate need of a boost. The Portuguese international received the ball on the edge of the area before dancing beyond the flailing Wolves defenders and rifling the ball into the top corner to draw his side level against the run of play. WORST PERFORMER - Defence was a real problem for Everton and it was more than just the rusty Baines who was to blame. Both centre-halves were absent for large spells and Tom Davies was far too casual in the midfield position ahead of them consistently conceding possession. It's Michael Keane who stands out in that back line though, as he was far too easily caught out of position with that ball over the top. 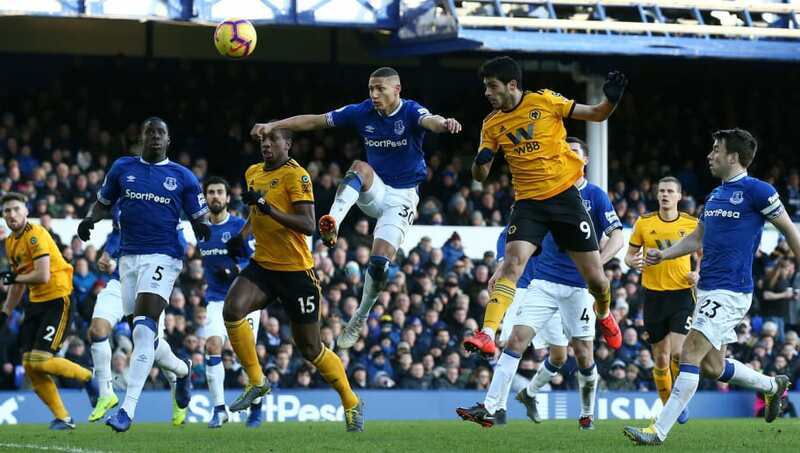 His needless challenge late in the first half gave his side a mountain to climb as Wolves scored from the preceding free kick after Gomes had got Everton back into the game. Wolves, by contrast, were very impressive and they controlled the game away from home against a top 10 side. It was easy to forget that this is the first season back in the top flight for Wolves compared to Everton who have 116 consecutive years at this level. The organisation and handling of the game is a testament to what Nuno Espirito Santo has achieved with Midlands side. Whilst it was comfortable in midfield, Wolves struggled to pull away from their lacklustre opponents as Gomes' goal reminded them; it was a fine margin of victory at times but they got the job done. STAR MAN - There was a number of top performers for Wolves they were everything their opponents weren't really all over the pitch. Credit to Joao Moutinho and Conor Coady for brilliant individual performances but it's Ruben Neves who has the honour. He was the pendulum to Wolves' momentum in midfield, picking up the ball deep in his own half and quickly converting it to a pinpoint counter attack. The Everton back line couldn't deal with those long searching balls and he kept his nerve from the spot to give his side the initial lead. WORST PERFORMER - The only underperformers that could be considered for Wolves would be the substitutes and certainly it was star man Neves who's shoes were the biggest to fill. Wolves were noticeably less effective once Romain Saiss was introduced for the injured Neves. Wolves will be hoping that knock isn't too serious because they'll want the Portuguese star in contention for the run-up to the end of the season. Everton have a tough week ahead with Manchester City visiting Goodison Park in mid-week before a trip to Watford. Wolves face an FA Cup replay against League One Shrewsbury up next before a winnable game at home to struggling Newcastle.